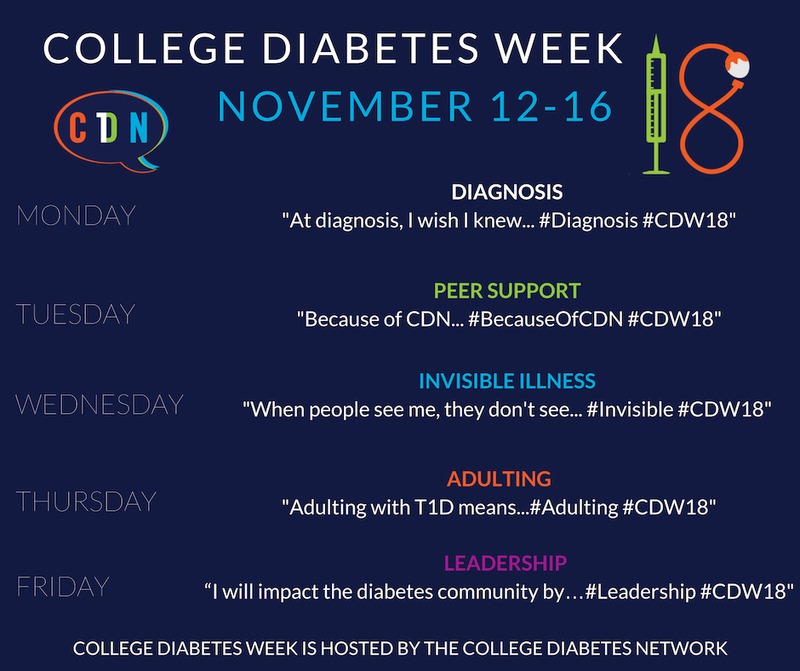 College Diabetes Week is November 12-16, 2018! What is College Diabetes Week? College Diabetes Week, founded by CDN students, is the College Diabetes Network’s annual celebration of living with type 1 diabetes in college, diabetes advocacy and education. One of the aspects of CDW is an exciting, week long social media campaign. In 2018, each day has a theme, and each theme has an accompanying prompt for reflection.These prompts are designed to help us tell the story of why the work Chapters do is so important. We encourage everyone to participate in this campaign, whether they are part of a Chapter, a parent, or a supporter. Just share your thoughts each day based on the theme! This year during College Diabetes Week, students and their network are fundraising for CDN. Did you know that among many other outcomes, 73% of CDN Chapter members report feeling less isolated after joining a CDN Chapter? Help us help as many young adults as possible by making a donation this week. You can either search for a current chapter to honor (maybe your alma mater!) or make a general donation to fund the next chapter! "College Diabetes Week is an opportunity to educatate people about diabetes risks, research, and reality." "To me, College Diabetes Week is an important time to raise awareness about type 1 diabetes (T1D) and to educate my community. It’s a chance to unite students, local, and national community members from coast to coast to amplify and educate about type 1 diabetes."